Played a total of 2087 times by 300 registered members. Finished by 298 users who rated the difficulty as easy. ODST - the word please is very nice. Your age is showing! mcr girl, I agree with suman! Where did you find that? It's adorable! 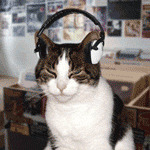 I just want to say that seeing mcr girl's little cat boppin' his head always brings a smile to my face. I enjoyed my stay on the top 8 while it lasted, haha. I hope your feeling better today Donna! Great clues, as usual Pa !! Thanks !! Good morning to all. A nice, easy game; asking to be played more than once. Hope y'all have a grand day - we are set to break temp records for the date (Indy area). It's supposed to be 95. I am sure glad I haven't closed the pool!